Why it’s daunting: There are very few casual Zappa fans. Maybe the occasional stoner uncle who knows that Frank Zappa named one of his kids “Moon Unit” and can hum the bassline to “Don’t Eat The Yellow Snow.” But this is more familiarity than fandom. Zappa fans are the kind whose fandom constitutes a basic pillar of their identity, like those who own their own tailored Starfleet uniform or slather on two-tone team-color face paint for an NFL tailgate party. 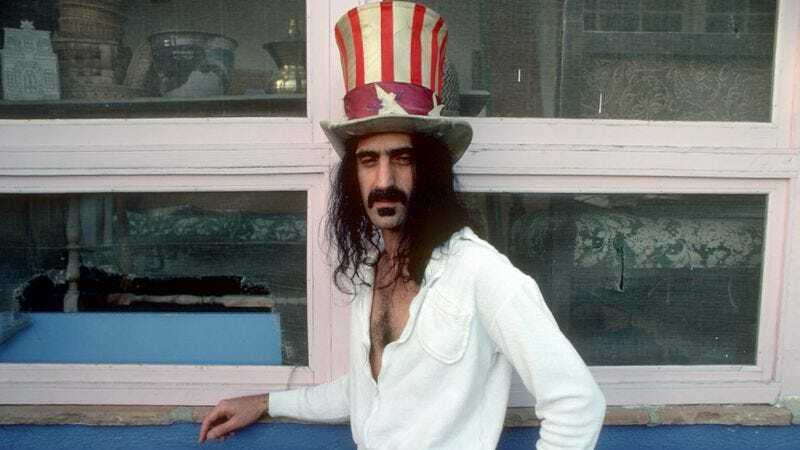 The basic line on Frank Zappa is that he’s “weird.” While that may be a little reductive, it’s also more or less true. His music is, if nothing else, peculiar—at times exultingly so. As such, it attracts listeners from various nonconformist fringes: tech-heads floored by Zappa’s blistering, top-shelf guitar solos; free-jazz aficionados and jam-band acolytes drawn in by the free-form sonic exploration; libertarians rallying around Zappa’s hardnosed opposition of government interference; tape-traders excited by the infinite possibilities of a given concert recording; cynics and satirists smirking at his skewering of the American cultural wasteland. (Matt Groening is reportedly a big fan.) Zappa fandom is like the sub-cultural melting pot, an oddball stew. Aside from this, his catalog—which is currently being reissued, courtesy of Universal—is massive. There’s something like 68 official releases, counting studio records and live albums (including the six-volume, double-disc You Can’t Do That On Stage Anymore series). Add to this the deep cuts, live concerts, and various compilations released via the Zappa Family Trust through their website, and the tally’s closer to 100. Given the sheer number of releases and the range between them in terms of sound—from psychedelic rock to symphony-orchestra recordings, from avant-jazz to rock opera—it can be hard to find a way in. Yet like most of the things that attract and nurture the attention of pop-culture obsessives, Frank Zappa’s music is exceptionally rewarding. Zappa conceived of everything he did as part of a grand artistic mission, which he termed “Project/Object” (or, elsewhere, “conceptual continuity”). It’s like a riff on Wagner’s concept of the Gesamtkunstwerk—a comprehensive, totalizing concept of art that ranged between albums, concert films, and even interviews. Musical phrases, ideas, and even characters reappear across albums, providing theoretical and attitudinal connective tissue. It may sound awfully pretentious, but the idea of understanding all parts as contributing to a grander whole serves as a kind of guiding beacon when wading through the mucks and mires of Zappa’s depthless back catalog. Its oscillations between more standard blues and psychedelic-inflected rock (“Hungry Freaks, Daddy”), mawkish malt-shop standards (“Go Cry On Somebody Else’s Shoulder,” “How Could I Be Such A Fool?”), and far-out sonic experiments (“It Can’t Happen Here,” “The Return Of The Son Of Monster Magnet”) make Freak Out! an entry-level Zappaphillic smorgasbord, a perfect sampling of the various modes his music worked through (well, some of the modes, anyway). Next steps: The best way to approach Zappa’s hulking mass of music is hunt-and-peck-style, moving forward chronologically. Part of the reason Zappa’s music is so satisfying is because there’s a discernible evolution as it progresses, which makes charging straight ahead, working through the exemplary albums of his many band incarnations, a suitable tactic. If Freak Out!’s not necessarily the best of Zappa’s Mothers Of Invention output (that title’s usually reserved for 1968’s We’re Only In It For The Money), it’s at least the most definitive of this period. Zappa’s most commercially successful album, 1974’s Apostrophe (’), produced his first charting single, in the form of the cautionary “Don’t Eat The Yellow Snow.” It’s probably the user-friendliest record of what’s often termed Zappa’s “Roxy period,” a reference to the exceptional live record Roxy & Elsewhere (also 1974). The lineup running roughly from 1973’s Over-Nite Sensation to 1975’s Captain Beefheart collaboration Bongo Fury—including percussionist Ruth Underwood, drummer Chester Thompson, keyboardist George Duke, bassist Tom Fowler, and saxophonist/flautist Napoleon Murphy Brock, known for his onstage back-and-forth banter with Zappa—is considered by many fans to be one the most notable incarnations of The Mothers Of Invention. (The second volume of You Can’t Do That On Stage Anymore, released in 1988, compiled some of this band’s best performances, recorded live in Helsinki, Finland.) Like much of Zappa’s music, the arrangements on Apostrophe (’), and throughout this period, are intricate even to the untrained ear. But unlike some of his later work, it’s never so dense as to be alienating, with Zappa’s band keeping everything, including the cheeky humor, sprightly and propulsive. The late ’70s marked the last gasp of peak-era Zappa (depending who you ask). The partial-live album Sheik Yerbouti was the first Zappa released independently, after a fallout with Warner Bros. Records. It amps up the comedy considerably, with prickly indictments of closeted homosexual frat boys (“Bobby Brown Goes Down”), Jewish-American stereotypes (“Jewish Princess”), and suburban dopes getting fleeced by lazy repairmen (“Flakes,” which includes a spot-on Bob Dylan impression). The triple-album rock opera Joe’s Garage, Acts I, II & III, released between September and November of 1979, is widely regarded as Zappa’s magnum opus. The album tells the story of Joe, an All-American boy in a garage band seduced by fame, a money-grubbing religion, and sexual deviancy. It’s probably the clearest distillation of the themes at play throughout Zappa’s work, in that it’s a complex concept album warning against the phoniness of organized religion and the rapaciousness of Big Government, peppered with scatological non-sequiturs. The epic, nearly two-hour record is capped off by “Watermelon In Easter Hay,” one of Zappa’s finest pieces of guitar-playing, regarded by many (including his son Dweezil), as the best solo he’d ever played. Where not to start: At the risk of writing off a whole decade: the ’80s stuff. After founding his own label, Barking Pumpkin Records, in 1981, there was nothing stopping Zappa’s onslaught of music. The early ’80s saw him churning out records that ranged from the pretty good (You Are What You Is), to a triptych of guitar-improvisations albums (the Shut Up ’N’ Play Yer Guitar records), to the plain lousy (The Man From Utopia, Ship Arriving Too Late To Save A Drowning Witch). There was even a cast recording of a Broadway musical about eugenics that was never produced (Thing-Fish). In the mid-to-late ’80s, Zappa joined the ranks of musicians protesting the censorship efforts of Tipper Gore and her Parents Music Resource Center. Beyond appearing in front of the U.S. Senate to vehemently decry the PMRC proposal to label “offensive” records (as, among other things, “an ill-conceived piece of nonsense”), Zappa devoted space on records and in live concerts to publically lambasting what he saw as America’s backslide into an Orwellian censorship state lorded over by a self-appointed legislature of busy-body Washington wives. 1985’s Frank Zappa Meets The Mothers Of Prevention was the culmination of this period: a dusty thesis record that aims to capture frustration, but errs into snarky self-persecution. Before his death from cancer in 1993, Zappa spent his later career recuperating his reputation as a composer and “serious musician.” 1986’s Jazz From Hell, recorded on a newfangled Synclavier (an early synthesizer and digital workstation), netted him a Grammy for Best Instrument Rock Performance, and 1993’s The Yellow Shark (released just a month before his death), an album of orchestral music performed by Germany’s Ensemble Modern, stands as the culmination of Zappa’s work as a composer. Yet these records, fine as they are, are far from what anyone could conceivably call “accessible” music. They’re more like rewards for hardened Zappaphiles who have diligently sifted through the mountains of other material. Similarly, the posthumous deep-cut catalog releases are more like rewards for superfans than necessary additions to any but the most complete collection (though the 2007 live album Buffalo is truly excellent).